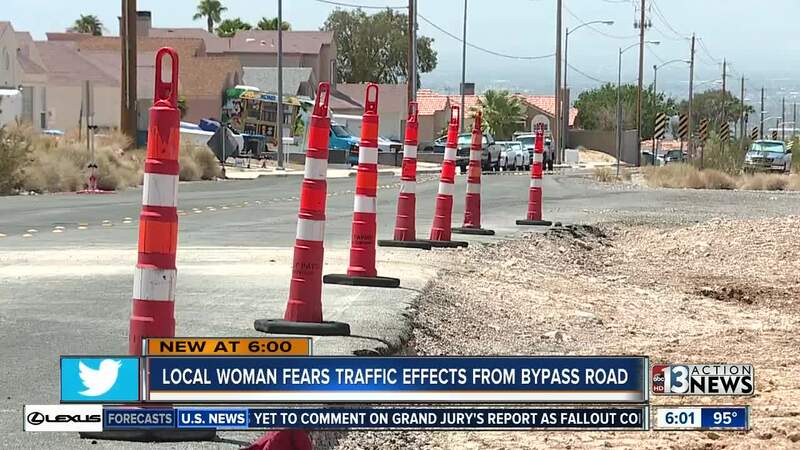 It is a much-anticipated road on the east side of Las Vegas meant to relieve thousands of people from rumbling truck traffic but not everyone is happy about the new Arnona Road solution. For years, people living near Mt. Hood Street and Alto Avenue have put up with heavy trucks hauling dirt, rock and gravel from a nearby facility. "How soon can we expect this new road? The truck traffic on Mt. Hood is out of control!" said one resident on Facebook in August 2017. "The trucks are being rerouted on a new road by the name of Arnona. The trucks will exit the quarry on the north end and proceed to the new road down to Lake Mead," replied Commissioner Marilyn Kirkpatrick via Facebook. Contact 13 observed and reported on dozens of semi trucks in just a 1-hour period during a weekday in April and it was turning the road surface into something that resembled alligator skin. On average, 140 large trucks pass through the neighborhood in an 8-hour period, based on Contact 13 calculations. A solution has been in the works for years in the form a new haul road for the trucks to bypass the neighborhoods while heading to Lake Mead Boulevard. Construction on Arnona Road broke ground recently and is expected to be finished by the end of 2018. The road begins at Alto Avenue, borders Shadow Rock Park and extends south to Lake Mead Boulevard. According to Clark County records , the road will be 32 feet wide. Resident Marie Hendricks says the new road is just feet from her home located at the base of Sunrise Mountain. “To take them from one suffering neighborhood and putting them through our yards, no notifications, no community input on this, we don’t feel that it is right," said Hendricks, who has lived in her home for more than 20 years. Hendricks has been an outspoken opponent of the road since learning about the proposed plan in April. “When I specifically raised my hand and spoke to [Commissioner Marilyn Kirkpatrick] specifically, I asked her where exactly this road was going she said 'you don’t have to worry about anything, it is not impacting your community whatsoever,'" Hendricks recalled. Clark County Commissioner Marilyn Kirkpatrick represents the area and held several community meetings that discussed many issues, including the new bypass road. Hendricks says initial information placed the new bypass road farther away from homes but as time went on residents realized it would be much closer. "The meeting was June 12 when [Commissioner Kirkpatrick] told us 500 feet [away from homes] and I knew it was a problem because she had changed her story," said Hendricks. Hendricks claims she confronted project leaders and learned shortly after, the new bypass road would be approximately half the distance originally thought from several homes, including hers. "They said it's more like 267 feet and shrinking," said Hendricks. There was no formal, written communication or notification of the road project. Once the road project was revealed, residents were told the road would be a minimum of 500 feet from homes. No impact studies were conducted for noise, traffic or the environment. Hendricks wants to be clear -- she does not oppose the road but would like to see a noise-barrier built between homes and the new route. On Facebook , Commissioner Kirkpatrick has addressed critics and constituents regarding the new road and says she has made the road project clear at every public meeting she's held. Contact 13 has reached out to Clark County and Commissioner Kirkpatrick regarding the issues raised by Hendricks. 1. Were residents notified formally by way of a mailer of the new Arnona Road project? 2. Did Commissioner Kirkpatrick mention a minimum 500 foot distance between homes and the new bypass road during a June 12 public meeting she held? A spokesperson says Commissioner Kirkpatrick denies making this statement. 3. Were there any studies done to examine traffic, noise, and environmental impacts of the new bypass road? 4. Can the road be moved the requested 500 foot minimum at this point? No. The county worked with multiple agencies including the City of North Las Vegas and Bureau of Land Management for the road alignment. The road is currently as far from homes as allowed under the current agreements. 5. Residents are requesting a noise reduction barrier (like a freeway wall) to be placed between the Arnona road and homes to the west of the project, can this be included?